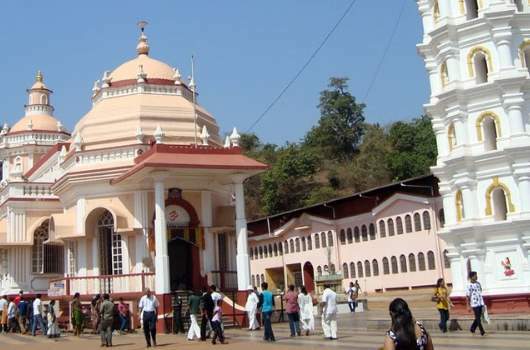 The small town of Marcel is the location of the temples of more than 15 deities of the Hindu pantheon. Marcel lies 17 km from Panaji in Ponda taluka about 3 kilometers away from Banastari Bridge on the Panaji-Ponda road. The unique feature of this temple is that this is the only temple in India where Lord Krishna is worshipped alongside mother Devaki as Devakikrishna. The main Deities Devakikrishna and affiliate deities of Bhumika Devi, Laxmi Ravalnath, Mallinath, Katyayani, Chodaneshwar and Dhada Shankar were originally located at Choodamani island (known as Chorao island today). To avoid persecution during the Portuguese Inquisition they were taken to Mayem in Bicholim and from there shifted to the present location at Marcel. The Garbha Griha (inner sanctum) of the temple has the beautiful idol of Devaki and Lord Krishna. The idol of Devaki is in standing posture with a child Krishna, between her legs. This particular pose is considered to be unique. The idols are beautifully carved in black stone. The palakhi is taken in Shukla and Trayodashi (except in Chaturmas). Ramanavmi, Gokulastami are celebrated on a grand scale. Limited accommodations are available. The major festival is Malni Purnima from Paush Vadya which is celebrated over here with great fervour and excitement.